I often hear fellow anime fans bash Disney, either due to the lack of violence and adult content in their releases, or because their themes are too childish. 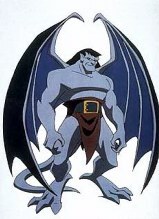 Well, while I won't get into that debate, I will say that Disney produced at least one show that no one should miss, and that show is my precious Gargoyles. While still squeaky-clean in Disney tradition, this show caters to a far more mature viewer than the usual kiddie-fare of Disney's movies and cartoons. Furthermore, Disney keeps up to their usual impeccable standards for animation, and even the blindest Disney basher cannont deny that their works look good. The series has excellent music (especially the perfect main theme), and the voice acting is done by an incredibly talented and high profile cast, consistingly largely of actors from the TV show Star Trek: The Next Generation. But the things that make this show great are the story, and, more importantly the characters. Read on and find out why. Gargoyles tells the story of a race of living gargoyles who come alive after the sun sets. They have existed for centuries, protecting and serving mankind. The storyline focues around the hero, Goliath, and his clan of fellow gargoyles who protected Castle Wyvern in Scotland a thousand years ago. The gargoyles are eventually betrayed by their human allies, and nearly all of them are murdered while they sit helplessly as statues during the day. Goliath and a few of his friends survive the slaughter and seek revenge on their betrayers. Goliath mistakenly believes his true love, Demona, to be slain, and when he is denied his vengeance, he succumbs to his grief and allows himself to be turned to stone for eternity. However, Goliath's rest is not to be. The story jumps a thousand years into the future to modern day New York. Billionare industrial tycoon, David Xanatos, has found the Grimorum Arcanorum, the spellbook of the magus who permanently turned Goliath and his friends to stone. 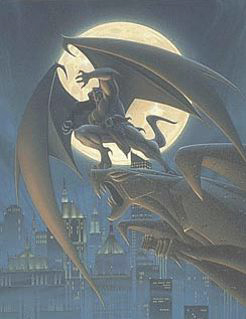 Xanatos has moved Castle Wyvern to the top of his New York skyscraper, raising the castle "above the clouds" thereby breaking the spell. The now freed gargoyles are stuck, friendless and confused, in an alien city a millenia past their time. At first they cautiously accept Xanatos as their only ally, however, he has secretly been planning to use them for his own ends all along. He reunites Goliath with Demona, who, to Goliath's surprise, managed to escape the slaughter that claimed most of their race. What the overjoyed Goliath does not know is that Demona blames him for the death of their clan, and has been living for centuries, hunted and harried by mankind, while Goliath has slept, oblivious to the world around him. When Goliath refuses to join her in her obsessive quest to destroy humanity, Demona turns her wrath on him. 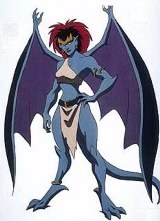 With the help of Xanatos, Demona becomes the gargoyles most deadly foe, returning time and time again to attack them. Yes, this show is truly one of a kind, and deserves to be ranked up there with the best anime shows I have seen. The story is always changing and growing, yet remains coherent and enjoyable. The storylines of the various characters are very engaging and touching, especially the conflict between Goliath and Demona. These two lovers turned arch-enemies obviously still care for each other, yet Demona's misguided hatred for humanity and Goliath's self-righteous stubborness leave them forever at odds. The other gargoyles are caught up in the struggle, and other foes like Xanatos with his endless plotting only serve to make every episode even more dynamic. New heroes and villains are always joining the cast, including Goliath and Demona's long-lost daughter, Angela, whose appearance, as you might expect, only serves to increase the tension and emotion between the two warring titans. This show is easy to overlook, but anyone who does so is only doing themselves a great misfortune. Beatifully made, and endlessly captivating, this is one cartoon that shows just what animation done right can give us. 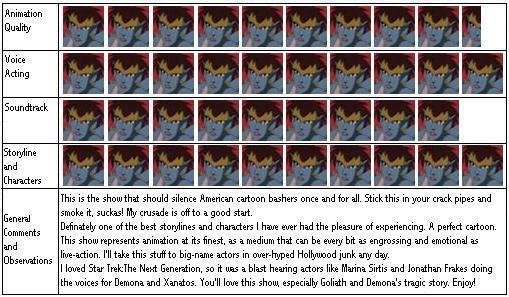 While I may be prejudiced, I give Gargoyles a perfect 10 out of 10!!!!!!!!!!! .